Manage your home services business at your office or on the go. GPS Insight engages with customers to reduce fleet operating costs, reduce risk and liability, and drive revenue. GPS Insight now offers an integration with FieldPulse to provide real-time vehicle location data in their all-in-one contractor solution. FieldPulse is a mobile workforce and business management solution that assists contractors with going digital and handling all information – from dispatching, scheduling, to invoicing and estimates – from one simple dashboard. 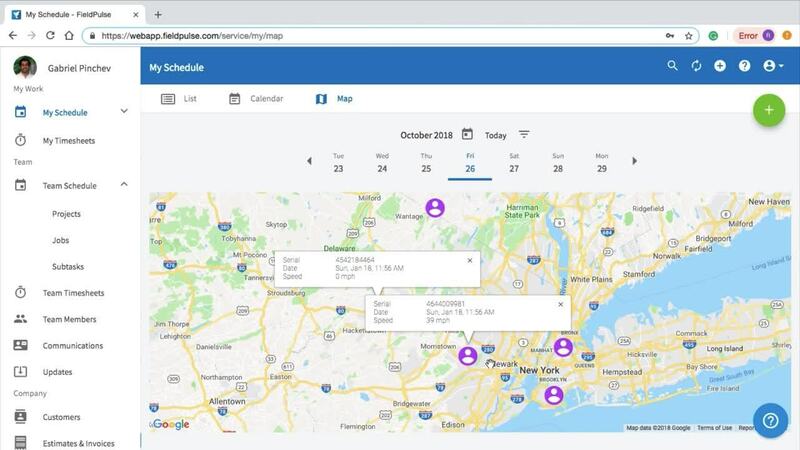 Whether you are in the office or on the go, FieldPulse provides the tools your business needs to manage customers, schedule jobs, track employee timecards and location, and more. Manually tracking job completion, estimates, and invoices on paper are not only time consuming for your employees; you are concerned manual processes are leading to critical oversights. Logging into multiple software to manage all of your business operations could be causing important data to be overlooked or underutilized. You need one platform to manage data in the office and from the field. Employees are manually tracking their hours, and you don’t know when they truly start or finish the workday. If multiple employees are rounding up their timesheets, it could be increasing labor costs. Integrating real-time vehicle locations from GPS Insight provides contractors fleet visibility straight from the FieldPulse interface. Eliminate the manual process of writing estimates and invoices on paper. Manage pre-defined invoice forms and collect signatures and payments in the field. Keep track of job costs electronically. Access all customer information from anywhere, at any time. Gain the ability to quickly see the status of opportunities and won/lost jobs. Figure out who to follow up with to help generate more revenue. See where your mobile workforce is at any given time. Verify employee timecards with the click of a button. Increase employee accountability for their hours worked and productivity.